It's been pretty much forever since I last posted, but I've got a bit of down-time so I'm going to make myself get the blogging bug again! Once I fall out of a routine of posting regularly (due to work etc) I often find it hard to get back into the swing of things - the first post after a break is always the hardest. 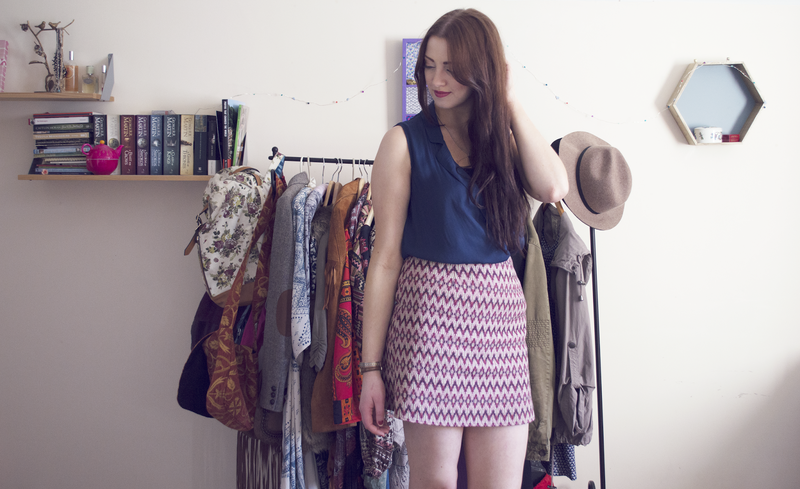 But here it is, and it's a summer outfit! My favourite kind! 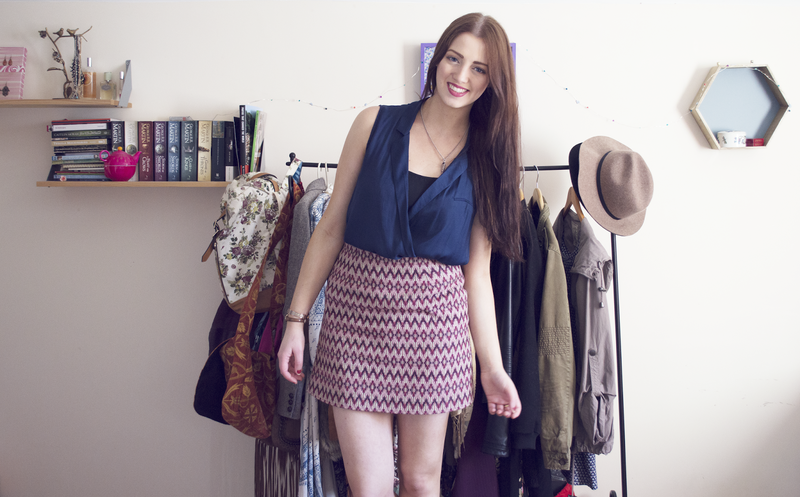 I love how versatile this skirt is - I've worn it on nights out before, as well as during the day and to work. I'm rarely seen in an outfit that doesn't feature a print or a splash of colour, and the muted colour palette of this skirt is perfect for injecting a bit of zest into workwear. Today, I actually attended a sort-of ideas workshop with a former employer of mine so I wanted to look fairly presentable! Luckily, the weather here in Cardiff was absolutely gorgeous today, which meant I could also don this Zara shirt. For me, this is the perfect kind of workwear - the loose, draping silhouette of the shirt just gives the outfit that slightly more bohemian look. I love finding ways to give more formal looks a bit of personality when possible, straight-up monochrome skirt/pant suits aren't really me! I've got my fingers crossed that this glorious weather sticks around; now that I've begun to delve into my summer wardrobe there's no way I'm turning back. Okay, I know it's only April, but still. Maybe we're on the edge of a loooong summer, Game of Thrones style (a girl can dream). I'm rambling. I think that's a sign that I'd better wrap this up! Aw, that skirt is super cute! I have the lovely weather continues. Yay for Game of Thrones being back! I think they will deviate from the book anyhoo. Welcome back! And what an outfit to come back with - the skirt is soo pretty!! I also love the nod to Game of Thrones! What did you think of the season premiere? I'm so excited for the upcoming changes they're planning to make. I've read the books but since the show will diverge from it from this point onward it's a bit unnerving to know that I'll be on my toes now! 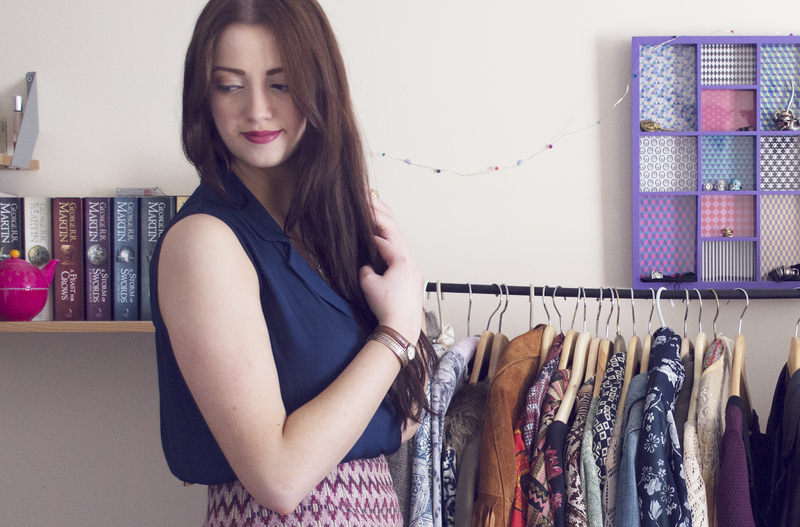 You look lovely, love the print of your skirt! Great look, love the skirt dear !